Members of the New York Democratic delegation, led by U.S. Senate Minority Leader Charles E. Schumer, U.S. Senator Kirsten Gillibrand and U.S. Representative Jerrold Nadler, joined Represen­tatives Gregory Meeks, Yvette Clarke, and Adriano Espaillat, this week in announcing the reintroduction of the African Burial Ground International Memorial Museum and Education Act. 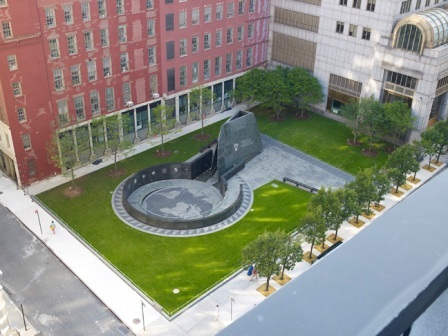 The legislation would establish a museum and education center at the African Burial Ground in Man­hattan, a site that currently holds the remains of an estimated 15,000 free and enslaved Africans and early-generation African-Americans from the colonial era, according to a news release from Schumer’s office. “Their resiliency should be commemorated, and their plight: never forgotten. Constructing the African Burial Ground Memorial Museum will serve to commemorate their bravery, remind us how long the journey towards justice has been, and contextualize the historical roots of the inequities that still persist to this day,” he said.